Come discover how forgiving and fun painting on tree-free Yupo paper is! Paint a "rainbow feather" (or two or three), in transparent watercolor on synthetic Yupo paper. The basics of painting on Yupo will be discussed while the instructor demonstrates. Students will then have the opportunity to create their own with the "tricks and tips" and hands-on guidance. Watercolor sits on the surface of Yupo paper, so you don't lose 30% of the brightness like you do on regular rag watercolor paper. 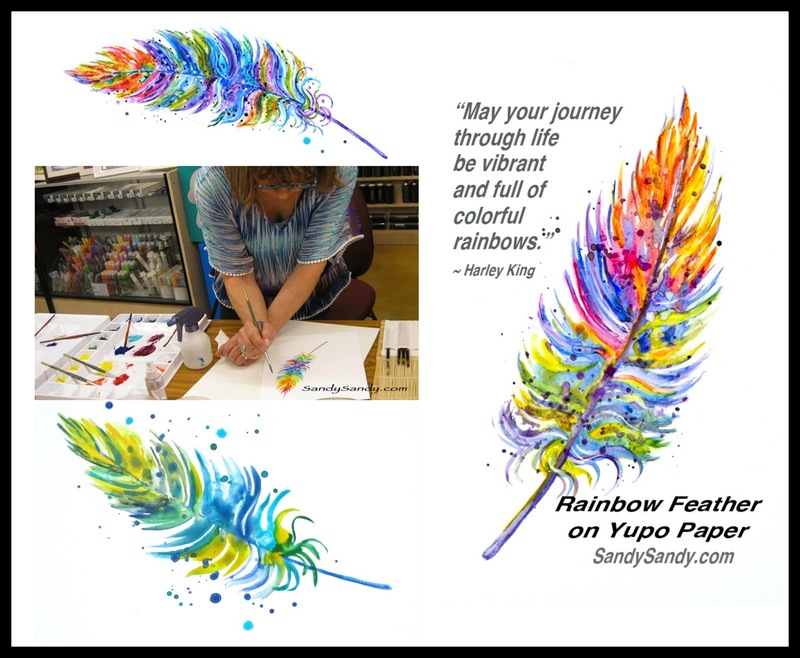 You will love creating these feathers. It is simple, fast paced and done without any preliminary drawing! It is fun for all skill levels. All Yupo paper will be supplied by Legion Paper. Students will only need to bring their watercolor supplies. Instructor -- Sandy Sandy See more information and register here. See supplies needed for the class here.